The gaga game, also known as, gaga ball is played in an octagonal shaped arena called a gaga ball pit. The game is played at camps, schools, and just about anywhere kids hang out. It’s quickly rising in popularity because it’s fast-paced, exciting, and appropriate for all ages! At Octopit USA, we make it our top priority to provide the best gaga ball pit on the market. Its convenience, durable materials, and easy to set up features gives it a leg up on all competitors’ models. Our gaga ball pit is made out of heavy steel and long-lasting polyvinyl, and does not require any fasteners, bolts, or locks unlike other types of children’s playground equipment. Its rubber foot pads protect finished gymnasium floors and prevent any slipping or sliding of the gaga pit. 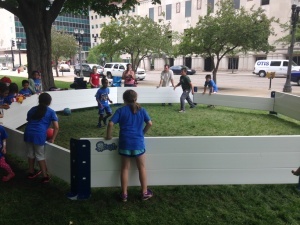 Octopit USA’s top quality gaga pit can also be installed permanently wherever you choose! However, it is also portable and can be conveniently carried or stored, making it a great game to bring to parties, playdates, and more! We also offer the option for custom sizes and widths so that if you have younger children who want to play, they can! This way, no one gets left out of the fun. The unique design snaps together for easy installation and takes approximately 15 minutes to set up. Once you set up the gaga ball pit, all you need are players and a soft foam or rubber ball. The goal of the game is to bat the ball around with the purpose of hitting your opponent below the waist. Any players who are hit must exit the playing area. The winner of the game is the last person standing in the gaga ball pit. Order an Octopit USA gaga ball pit today and we promise you will not regret it! Any questions on our highly rated gaga pit, call or text us at (248) 752-8165! In the past, gaga ball (sometimes written as “ga-ga ball”) was a relatively obscure game that most people had never heard about. However, its popularity at youth camps, churches, and schools is quickly growing because most age groups can play it safely. The game is also known as Octoball, Gorilla Ball, or Israeli Dodgeball and is a fast paced sport. 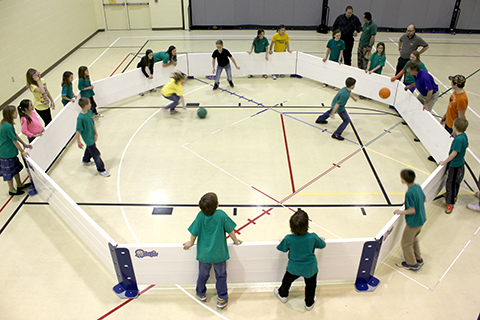 Gaga ball is played in an octagon shaped enclosure, also known as a gaga pit. The more players, the better! It is played with a soft foam ball and combines the skills of dodging, striking, running, and jumping while trying to hit opponents with a ball below the waist or knees. While there are homemade versions of the gaga pit, these are unstable and difficult to put together. They are inconvenient to transport, made of wood, and require gaga ball brackets for assembly, which also requires a lag screw or bolt. Portable or can be installed permanently. For any questions or comments on the best gaga pit on the market, call or text us at (248) 752-8165! You can also contact us by clicking here. Our professional staff is more than happy to get your fun started!